Bridesmaids are part of the wedding party. When a woman gets married she is the bride, and then the bride can choose some very close women in her life to serve as her bridesmaids. Bridesmaids take over certain responsibilities for the bride, and a bridesmaid really should be called more like a bridal assistant. As a bridesmaid, you have been there every step of the way to make sure all the plans are taken care of. The big day has finally arrived and everything should go according to plan. However, what if there is something that comes up that can be deemed an emergency? Did you know that there are emergency kits for bridesmaids? 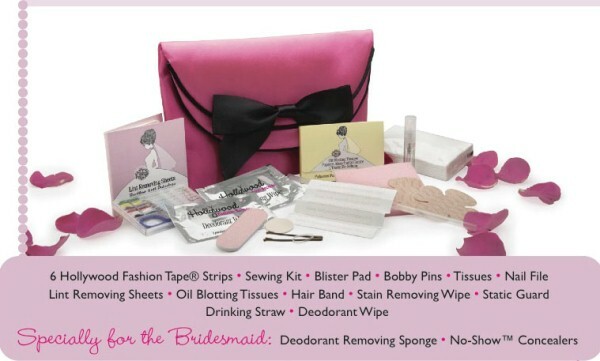 Here is more information on the benefits of a bridesmaid emergency kit. Life can be unpredictable, and nothing can be more unpredictable than the day of a very big and important event like a party or a wedding. Sometimes a person can bump into someone and get a stain on their beautiful dress. What if you accidentally shed a button? You need an emergency kit because it will contain everything you need to fix a hem, replace a button, or even remove a stain. Whether you mean it as a joke or not, the gift of a fashion emergency kit for the bride can really be meaningful and special. You want to show the bride that you care enough about your role as a bridesmaid to be as prepared as possible for any kind of emergency that may arise. Both Boy Scouts and bridesmaids should always be prepared, and your friend the bride will be touched at your thoughtfulness. The emergency kit for bridesmaids does more than save the big wedding day. The kit itself comes enclosed in a beautiful pink purse (white purse for bride's fashion kit) that can be useful to the bride. Even though she may not think about it, the bride is going to need a small purse and the kit will make a fashionable yet useful purse. A bridesmaid has a lot of responsibility when she accepts the position from her friend the bride. A bridesmaid will assist the bride as best she can as the big day approaches. 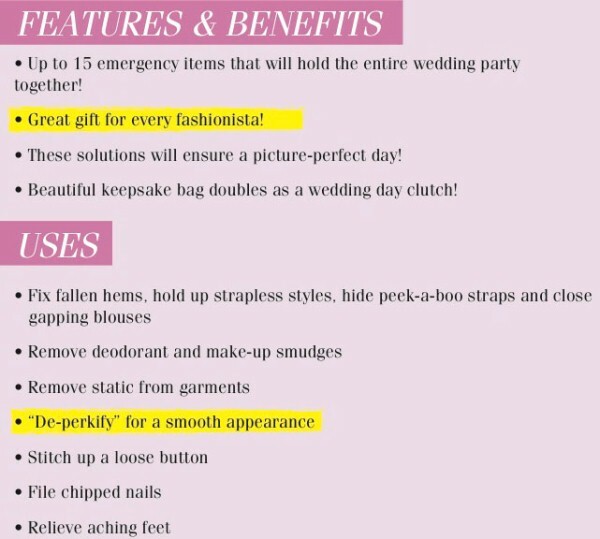 To make sure things on the wedding day go smoothly, there is a bridesmaid's fashion emergency kit that is available to buy. A bridesmaid will go above and beyond her duties if she has a kit handy in case something goes wrong. 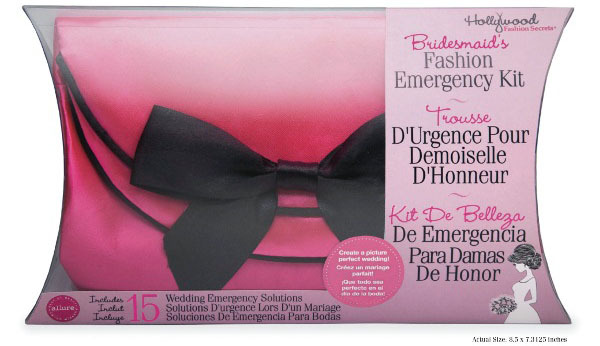 Up to 15 emergency items that will hold the entire wedding party together!